With February being Library Lovers’ Month, the entire month is dedicated to the people who love whole buildings devoted to the reading, housing, organising, categorising, finding, studying, and otherwise loving books. Community caught up with four of the top librarians in Qatar for a talk in a two-part series. Here are excerpts from chats with Mumtaz Moosa, Primary Librarian, Al Jazeera School, and Amy Andres, Director of Libraries, Virginia Commonwealth University in Qatar (VCU-Q). What special role does the library you head play for the community it serves, and how? Mumtaz: I believe that the school library is central to learning and plays a key role as a place for encouraging innovation, curiosity, and problem-solving. A library is a place where the students can expand their classroom learning by reading creative works by authors from around the world. We, at Al Jazeera, aim to enable our students to think creatively and expand their skills by exposing them to works by different authors. We also celebrate Reading Week every year to further foster our student’s interaction with the creative world. During this week, we hold book review competitions to get students to think critically about the creative work. Our library is a catalyst for literacy and reading. Our school libraries make a difference in students’ understanding and achievement. We provide support for teaching and learning throughout the school. Our library is an important part of the academic community and reflects the Islamic values. It can be a central point for engagement with all kinds of reading, cultural activities, access to information, knowledge building, deep thinking and lively discussion. I am working in the primary school library where I serve and cater to the need of younger students ranging from the ages of 4 to 12. The students enhance their vocabulary through our library books. In my library, you will find a collection of books that cater to the needs of all age year groups. For years 1-3, the books that are available have more illustration and moral stories. For key stage two group, we have non-fiction books. Even the parents of the students are highly involved and make visits to the library to pick out books for their children. 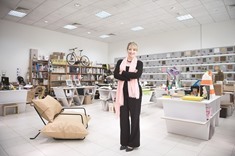 Amy: The libraries at Virginia Commonwealth University in Qatar serve as an icon for the intellectual, artistic, and creative pursuits of the school’s students and faculty – as well as for the Doha community. They provide a wealth of resources to inform and inspire their users. While the core of the collection provides direct support for artists, designers, and art historians, we also aim to cultivate collections that encourage exploration and innovation in interdisciplinary studies. VCUQatar Libraries also have special collections that include artists’ books and rare books on the history and culture of Qatar. The VCUQatar library culture is also unique and special to our school. Our libraries are less traditional and clearly reflect the learning and working practices of artists and designers. What is the best part about being a librarian and getting to spend endless hours with books all around you? Amy: Libraries have transformed significantly in the past 50 years, and so has the profession. Unfortunately, the image of librarians surrounded by books is a stereotype that continues to persist. But this image is outdated and does not well represent the profession in the 21st century. Librarians are expert at managing a complex range of institutional resources – not just books. Depending upon the needs of their respective institutions, librarians may also provide leadership in areas related to digital technologies, pedagogy, data curation, intellectual property, copyright, publishing, and bibliometrics. The profession of librarianship requires one to possess in-depth knowledge in many subject areas. What do you think makes the library a bastion of knowledge and wisdom even as digital media and devices take over our lives? Also, is integrating into the digital platform the way ahead for the traditional libraries? Mumtaz: In this digital sphere, more and more books are migrating online. I do believe that digitisation is the future. We are becoming more and more tech-savvy. The young children spend more time with their digital gadgets than with their toys. However, I still believe that the library represents a physical space that contains incredible knowledge. The feeling of holding a physical book is more personal and intimate than holding on to an iPad. Walking around the library browsing the books is more intricate than scrolling down a screen. Despite the digitisation, the library would remain a significant physical space that allows for promoting literacy and reading. In addition, digital media is cluttered with inconsistencies and inaccuracies. The books published and present in the library are usually well-proof read and evaluated. The information available online can be more or less modified by anyone but the information within the library is accurate. Amy: Libraries were early adopters of digital technologies and librarians have led the way in transitioning their institutions to the digital age. As the digital age evolves, so too will the paradigms of how information is produced and retrieved. Libraries will remain as positive change agents in this evolution and keep pace by expanding the ways in which information is made accessible.